How Does Henna Dye Gray Hair? If you henna hair that has no melanin, the only color you see from henna is the Lawsone red-orange color. If the lawsone content is low, the color will be weak red-orange. If the lawsone content is high, the color will be dark red-orange, oxidizing to deep auburn. If you don't want orange-popsicle colored hair, you'll need to get the greatest dye saturation possible, or add other dye plants to your mix. If you have gray hair, and want a rich, deep red color, it is crucial to purchase body art quality henna that has been sent to a lab and tested for lawsone content! 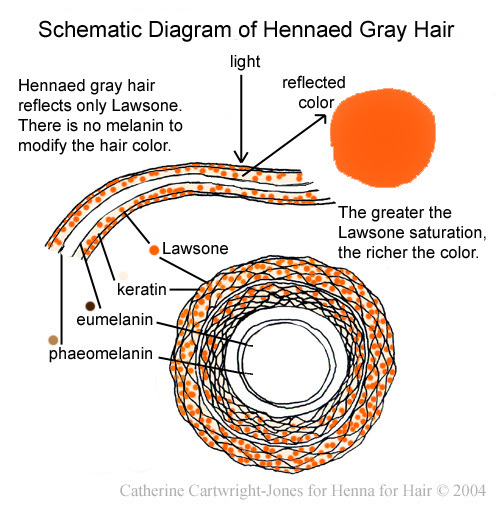 If the henna has less than 2.2% lawsone content, your gray will look coppery. If the lawsone content is 2.3% or above, you'll get good gray coverage. The higher the lawsone content, the darker and richer the color. If you get laboratory tested and certified body art quality henna, and leave the henna paste in your hair for several hours, wrapped in plastic, you'll get greater dye saturation and richer color! Many people are able to dye their gray hair dark red and auburn with repeated applications of body art quality henna. The hair takes up a bit more dye each time. If the idea of dye saturation seems confusing, compare it to this again: if you put a wet teabag on a white table cloth, the tannin in the tea "migrates" from the teabag into the cloth fibers, binds with those fibers, and leaves a stain. And, the longer you leave the teabag there, the darker the stain. The stronger the tea in the teabag, the darker the stain. The more times you plunk a wet teabag down on the same cloth, the darker the stain. When you first rinse the body art quality henna out of your hair, the hair may appear firey Bozo the Clown orange, but this color will darken and mellow over the first few days, just as henna stains on skin darken. Do not panic. If you're really worried, ask questions on the forum or call the help desk at 330-673-0600!